This article is about the Mariah Carey song that has been covered by many artists. For other uses, see All I Want for Christmas Is You (disambiguation). (1994) "Joy to the World"
Two music videos were commissioned for the song: the song's primary music video features grainy home-movie-style footage of Carey, her dogs and family during the holiday season, as well as Carey dressed in a Santa suit frolicking on a snowy mountainside. Carey's then-husband Tommy Mottola makes a cameo appearance as Santa Claus, bringing Carey a gift and leaving on a red sleigh. The second video was filmed in black and white, and features Carey dressed in 1960s style in homage to The Ronettes, alongside back up singers and female dancers. Carey has performed "All I Want for Christmas Is You" during numerous live television appearances and tours throughout her career. In 2010, Carey re-recorded the song for her second holiday album, Merry Christmas II You, titled "All I Want for Christmas Is You (Extra Festive)". Carey also re-recorded the song as a duet with Canadian singer Justin Bieber for his 2011 album Under the Mistletoe, titled "All I Want for Christmas for You (SuperFestive!)". The song has also been covered by many artists over the years. In the years since its original release, "All I Want for Christmas Is You" has been critically acclaimed; it was once called "one of the few worthy modern additions to the holiday canon" in The New Yorker. It has become established as a Christmas standard and continues to surge in popularity each holiday season. The song was commercially successful, topping the charts in Australia, Austria, Canada, the Czech Republic, Denmark, Finland, France, Hungary, the Netherlands, New Zealand, Norway, Portugal, Slovakia, Slovenia, Sweden and Switzerland while reaching number two in Japan, Germany and the United Kingdom, number three in the United States, and the top 10 in several other countries. With global sales of over 16 million copies, the song remains Carey's biggest international success and is the 7th best-selling single of all time. As of 2017, the song was reported to have earned $60 million in royalties. Following the success of the singer's 1993 career best-selling album Music Box, Carey and her management at Columbia Records began devising ideas and strategies for subsequent projects. Carey's then-husband, Tommy Mottola, head of Columbia's parent label Sony Music Entertainment, began mapping out possible follow ups for the singer during the pinnacle years of her career. During initial discussions regarding the thought of doing a Christmas-themed album with Carey and her authorship-composition partner of over four years, Walter Afanasieff, the fear arose that it was not commercially expedient or wise to release holiday music at the peak of one's career, as it was more often equated with a release towards the end of a musician's waning career. Afanasieff recalled his sentiments during initial discussions for a holiday record: "Back then, you didn't have a lot of artists with Christmas albums. It wasn't a known science at all back then, and there was nobody who did new, big Christmas songs. So we were going to release it as kind of an everyday, 'Hey, you know, we're putting out a Christmas album. No big deal.'" Ultimately, with Mottola's persistence, Carey and Afanasieff began writing and composing songs for its parent album, Merry Christmas, during the summer of 1994. "All I Want for Christmas Is You" was recorded that August, and took Carey and Afanasieff a total of fifteen minutes to write and compose. Often referencing herself a festive person and demonstrating a usual penchant for her love of all things Christmas, Carey began decorating the home she then shared with Mottola in upstate New York (which also came equipped with a personal recording studio) with Christmas ornaments and other holiday-inspired trinkets. In doing so, Carey felt she could capture the essence and spirit of what she was singing and make her vocal performance and delivery more emotive and authentic. The songwriting pair carved out the chords, structure and melody for the song in just a quarter of an hour. "It's definitely not 'Swan Lake,'" admits Afanasieff. "But that's why it's so popular--because it's so simple and palatable!" It was always the same sort of system with us. We would write the nucleus of the song, the melody primary music, and then some of the words were there as we finished writing it. I started playing some rock 'n' roll piano and started boogie woogie-ing my left hand, and that inspired Mariah to come up with the melodic [Sings.] 'I don't want a lot for Christmas.' And then we started singing and playing around with this rock 'n' roll boogie song, which immediately came out to be the nucleus of what would end up being 'All I Want For Christmas Is You.' That one went very quickly: It was an easier song to write than some of the other ones. It was very formulaic, not a lot of chord changes. I tried to make it a little more unique, putting in some special chords that you really don't hear a lot of, which made it unique and special. Then for the next week or two Mariah would call me and say, 'What do you think about this bit?' We would talk a little bit until she got the lyrics all nicely coordinated and done. And then we just waited until the sessions began, which were in the summer of '94 where we got together in New York and started recording. And that's when we first hear her at the microphone singing, and the rest is history. Afanasieff flew back to California, where he finished the song's programming and production. Originally, he had a live band play the drums and other instruments with the thought of giving it a more raw and affective sound. He was unhappy with the results of the recording and subsequently scrapped the effort and used his original, personal arrangement and programmed all the instruments heard on the song (with the exception of the background vocals) including the piano, effects, drums and triangle. While Carey continued writing material in her rented home in The Hamptons, Afanasieff completed the song's programming and awaited to rendezvous with her a final time in order to layer and harmonize the background vocals. In touching on several aspects of what excited her to record and release her Christmas album, Carey went into detail on what writing and recording the song and album meant for her, pointing out, "I'm a very festive person and I love the holidays. I've sung Christmas songs since I was a little girl. I used to go Christmas caroling. When it came to the album, we had to have a nice balance between standard Christian hymns and fun songs. It was definitely a priority for me to write at least a few new songs, but for the most part people really want to hear the standards at Christmas time, no matter how good a new song is." A sample of the song's chorus and various computerized programming, instruments and background vocals. Combined with Carey's voice, the sample illustrates the song's hearkening and inspiration drawn from previous decades as well as what music critics attribute its success to. "All I Want for Christmas Is You" is an uptempo song, composed with pop, soul, R&B, gospel, dance-pop and rhythmic adult contemporary influences and stylings. By early August, Carey already had two original songs written alongside Afanasieff: the "sad and ballad-y" "Miss You Most (At Christmas Time)" and the "Gospel-tinged and religious" "Jesus Born on This Day". The third and final original song the pair planned to write was to be centered and inspired and in the vein of a "Phil Spector, old rock 'n roll, sixties-sounding Christmas song". The song begins with a "sparking" bit of percussion "that resembles an antique music box or a whimsical snow globe." After Carey's a cappella style vocal introduction, the song introduces other seasonal percussive signifiers including; celebratory church-like bells, cheerful sleigh bells, and "an underlying rhythmic beat that sounds like the loping pace of a horse or reindeer. These sounds echo religious and secular musical touchstones, without veering blatantly too much in either direction, and give the song an upbeat, joyous tone." "Carey's masterpiece is an incredible feat of philosophical subterfuge. Christmas is a time of material and affection-based excess, yet the song is narrowly focused on just one thing: getting to be with a specific person; you. It rejects the idea of love in general in favor of love in particular, simultaneously defying and defining pop-music conventions. With more economy of expression and undoubtedly catchier lyrics, 'Want' is a sort of Hegelian dialectic of Christmastime desire, taking the conflicting notions of abundance and specificity and packaging them into an earworm for the generations." In an interview in 1994, Carey described the song as "fun", and continued: "It's very traditional, old-fashioned Christmas. It's very retro, kind of '60s." Afanasieff went further in breaking down the song's musical elements: "A lush bed of keyboards, reminiscent of a small-scale Wall of Sound, cushions the song's cheery rhythms, while a soulful vocal chorus adds robust oohs, tension-creating counter-melodies, and festive harmonies. Most notably, however, the song's jaunty piano chords and melody keep the song merrily bouncing along." Lyrically, the song describes the yearning desire to be with a loved one for Christmas, regardless of whether they have to forgo the usual commercial aspect of the holiday season such as ornamental lights, trees, snow and presents. The song incorporates various instruments, including piano, drums, violin, oboe, flute, bell chimes, bass effect, and cowbells. The song layers background vocals throughout the chorus and sections of the bridge. "All I Want for Christmas Is You" is played at an original tempo of 150.162 beats per minute. According to the sheet music published at Musicnotes.com by Sony/ATV Music Publishing, the song is set in common time and in the key of G major. Carey's vocal range in the song spans from the note of G3 to the high note of A6. Carey wrote the song's lyrics and melody, while Afanasieff arranged and produced the piece with synthetically created computerized equipment. Slate's Ragusea counts "at least 13 distinct chords at work, resulting in a sumptuously chromatic melody. The song also includes what I consider the most Christmassy chord of all—a minor subdominant, or 'iv,' chord with an added 6, under the words 'underneath the Christmas tree,' among other places. (You might also analyze it as a half-diminished 'ii' 7th chord, but either interpretation seems accurate)." According to Roch Parisien from AllMusic, the song contains "The Beach Boys-style harmonies, jangling bells, and a sleigh-ride pace, injecting one of the few bits of exuberant fun in this otherwise vanilla set." Critics have noted the song's 1940s, 1950s, and 1960s influences which, in conjunction with Carey's voice and its simple melody, heralded its recipe for success. In discussing the song's chord progression and stylistic approaches, Slate's Adam Ragusea hailed the song as "the only Christmas song written in the last half-century worthy of inclusion in the Great American Songbook." The A.V. Club's Annie Zaleski attributes the song's enduring appeal to its ambiguity in being able to pin it down as belonging to a specific era. Critics also noted the song a tad reminiscent of the works of Judy Garland and Nat King Cole, while also describing it as hearkening back to "'60s and '70s Motown covers of prewar Christmas classics, such as The Jackson 5's [and] Stevie Wonder". Slate's Ragusea conceded that "All I Want For Christmas Is You" "sounds like it could have been written in the '40s and locked in a Brill Building safe." In a piece on the song in Vogue, a writer felt the song's lyrics helped solidify its status over two decades later: "those lyrics could have been sung by Frank Sinatra—well, maybe not Frank, but another singer back then. I think that's what gives it that timeless, classic quality." "All I Want for Christmas Is You" received critical acclaim from music critics. Parisien called the song "a year-long banger", complimenting its instrumentation and melody. Steve Morse, editor of The Boston Globe, wrote that Carey sang with a lot of soul. According to Barry Schwartz from Stylus Magazine, "to say this song is an instant classic somehow doesn't capture its amazingicity; it's a modern standard: joyous, exhilarating, loud, with even a hint of longing." Schwartz praised the song's lyrics as well, describing them as "beautifully phrased," and calling Carey's voice "gorgeous" and "sincere." Kyle Anderson from MTV labeled the track "a majestic anthem full of chimes, sleigh bells, doo-wop flourishes, sweeping strings and one of the most dynamic and clean vocal performances of Carey's career". While reviewing the 2009 remix version, Becky Bain from Idolator called the song a "timeless classic" and wrote, "We love the original song to pieces—we blast it while decorating our Christmas tree and lighting our Menorah." Shona Craven of Scotland's The Herald, said, "[it's] a song of optimism and joy that maybe, just maybe, hints at the real meaning of Christmas." Additionally, she felt the main reason it was so successful is the subject "you" in the lyrics, explaining, "Perhaps what makes the song such a huge hit is the fact that it's for absolutely everyone." Craven opened her review with a bold statement: "Bing Crosby may well be turning in his grave, but no child of the 1980s will be surprised to see Mariah Carey's sublime All I Want For Christmas Is You bounding up the charts after being named the nation's top festive song." In his review for Carey's Merry Christmas II You, Thomas Connor from the Chicago Sun-Times called the song "a simple, well-crafted chestnut and one of the last great additions to the Christmas pop canon". In a 2006 retrospective look at Carey's career, Sasha Frere-Jones of The New Yorker said, the "charming" song was one of Carey's biggest accomplishments, calling it "one of the few worthy modern additions to the holiday canon". Dan Hancox, editor of The National, quoted and agreed with Jones' statement, calling the song "perfection". In the United States, in the first week of January 1995, "All I Want for Christmas Is You" peaked at number six on the Billboard Hot Adult Contemporary and at No. 12 on the Hot 100 Airplay chart. The song placed on these two charts again in December 1995 and in December 1996. The song was ineligible for inclusion on the Billboard Hot 100 during its original release, because it was not released commercially as a single. This rule lapsed in 1998, however, allowing the song to chart on the Billboard Hot 100 (peaking at No. 83 in January 2000). The song topped the Billboard Hot Digital Songs chart in December 2005, but it was unable to attain a new peak on the Billboard Hot 100 chart because it was considered a recurrent single and was thus ineligible for chart re-entry. Every December from 2005 to 2008, the song topped the Billboard Hot 100 Re-currents chart. In 2012, after the recurrent rule was revised to allow all songs in the top 50 onto the Billboard Hot 100 chart, the single re-entered the chart at No. 29 and peaked at number 21 for the week ending January 5, 2013. In December 2017, the song reached number nine on the Billboard Hot 100, giving Carey her 28th top ten in the country and first since "Obsessed" in 2009. "All I Want For Christmas Is You" subsequently rose to number three on the chart dated January 5, 2019, becoming the second holiday track to reach its top five after "The Chipmunk Song (Christmas Don't Be Late)" by David Seville and the Chipmunks peaked at number one in 1958. As of December 16, 2017, it has topped the Billboard Holiday 100 chart for a record-extending 27 cumulative weeks. No other song has spent more than two weeks at No. 1 on the Holiday 100 since the chart's launch in 2011. It has become the first holiday ringtone to be certified double-platinum by the Recording Industry Association of America (RIAA). Additionally, of songs recorded before the year 2000, it is the best-selling digital single by a woman, as well as the overall best-selling holiday digital single. As of December 2017, Nielsen SoundScan estimated total sales of the digital track at 3,415,000 downloads. In the United Kingdom, the song entered the UK Singles Chart at number 5 during the week of December 10, 1994. The following week, the song peaked at number 2, staying there for the final three weeks of December (held out of the coveted "Christmas No. 1" honor by East 17's "Stay Another Day"). As of January 27, 2017, it had spent seventy-eight weeks on the UK Singles Chart. As of December 19, 2013, "All I Want for Christmas Is You" has sold one million copies in the UK. On September 28, 2018, it was certified triple platinum by the British Phonographic Industry for shipment of 1.8 million units (including streams) and remains Carey's best-selling single in the UK. In 2010, "All I Want for Christmas Is You" was named the No. 1 holiday song of the decade in the United Kingdom. The song peaked at number 2 in the United Kingdom for a second time in December 2017 due to strong downloads and streaming. It made number 2 for the third time in 2018. The song originally peaked at No. 2 on the Australian Singles Chart in 1994, and was certified five-times platinum by the Australian Recording Industry Association (ARIA), denoting shipments of over 350,000 units. "All I Want For Christmas Is You" topped the chart in December 2018, becoming the first Christmas song to do so in the 21st century and giving Carey her third number-one song in the country after "Fantasy" in 1995 and "We Belong Together" in 2005. This also made her the eleventh musical acts to reach the country's summit in three back-to-back decades. It additionally was the first Christmas track since "Snoopy's Christmas" by The Royal Guardsmen in 1967 to peak at number one in Australia during the Christmas season. The song also topped the New Zealand Charts for the first time in 2018, making Carey's eighth number-one single in the country. In Denmark, it peaked at No. 4, staying in the chart for sixteen weeks and being certified gold by the International Federation of the Phonographic Industry (IFPI). But in December 2018, it topped the charts in Denmark, peaking at No. 1. In France, "All I Want For Christmas Is You" became Carey's first number-one single in that country as topping the charts in the week of December 28, 2018, surpassing her previous peak at No. 2 on the French Singles Chart. "All I Want for Christmas Is You" became Carey's best-selling single in Japan. It was used as the theme song to the popular drama 29-sai no Christmas (29才のクリスマス, lit. "Christmas in 29 Years, 29th Christmas"), and was titled Koibito-tachi no Christmas (恋人たちのクリスマス, lit. "Lovers' Christmas"). The single peaked at No. 2 for two weeks, blocked from the top spot by "Tomorrow Never Knows" and "Everybody Goes", both released by rock band Mr. Children. It sold in excess of 1.1 million units in Japan. Due to strong sales and airplay, the song re-charted in Japan in 2010, peaking at No. 6 on the Japan Hot 100. The single has been certified the Million award by the Recording Industry Association of Japan (RIAJ) on two different formats (compact disc and ringtone), in 1994 and 2008, respectively. On December 25, 2018, the song set the single-day record for most Spotify streams, with 10.82 million plays. Carey has performed the song during concerts as well as live televised performances. It was part of the set-list during the Japanese shows of Carey's Daydream World Tour (1996), Butterfly World Tour (1998), Charmbracelet World Tour (2002–03), and The Adventures of Mimi Tour (2006). Additionally, Carey performed the song at the 2004 Walt Disney World Christmas Day Parade, which aired on ABC. Carey sang the So So Def remix version at the opening night of her Angels Advocate Tour on New Year's Eve. On November 9, 2010, Carey taped a live Christmas Special featuring the song, which aired on December 13, 2010 on ABC. Additionally, Carey performed the song alongside "Oh Santa!" airing on ESPN and ABC throughout the day on Christmas Day of 2010. 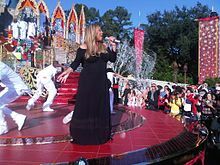 On December 3, she performed both songs at the Walt Disney World Resort theme park, Magic Kingdom, in a performance that was taped and aired part of the Walt Disney World Christmas Day Parade on ABC. She performed them again in a music video promoting the day's NBA games that aired on both networks. Carey also included the track as the encore to her sold out, first annual Christmas concert series at the Beacon Theater in New York City. The show was entitled All I Want For Christmas Is You, A Night of Joy & Festivity. During The Late Late Show with James Corden on December 15, 2016, Mariah Carey sang this song on the popular feature Carpool Karaoke. Fellow singers Adele, Lady Gaga, Demi Lovato, Nick Jonas, Elton John, Selena Gomez, Gwen Stefani, Chris Martin and the band Red Hot Chili Peppers were featured in the video. It quickly went viral, achieving over 2 million views in less than 24 hours, and 25 million views in less than three weeks. There are three music videos for "All I Want for Christmas Is You". The first, primary video was shot in the style of a home movie using Super-8mm film; it was directed and filmed by Carey during the Christmas season of 1993. The video begins with Carey placing holiday ornaments on a Christmas tree and frolicking through the snowy mountainside. Outdoor scenes were shot at the Fairy Tale Forest in New Jersey, where Carey's then-husband Tommy Mottola made a cameo appearance as Santa Claus. It continues with scenes of Carey getting ready for her album cover photo shoot and spending time with her dog Jack. It concludes with Santa Claus leaving Carey with a bag of presents and waving goodbye. It has more than 530 million views on YouTube as of December 2018. In the song's alternate video, inspired by The Ronettes, Carey dances in a 1960s-influenced studio surrounded by go–go dancers. For a 1960s look, the video was filmed in black and white, with Carey in white boots and teased up hair. This video was also directed by Carey. There are two edits to this version of the video. "All I Want for Christmas Is You" has charted every holiday season since its original release. In December 2017, the song reached number nine on the Billboard Hot 100, making it the first holiday song to enter Hot 100's top ten since Kenny G's cover of "Auld Lang Syne" in January 2000. It became Carey's 28th top ten single in the Hot 100. In December 2018, the song became the second holiday song in the 60-year history of the Hot 100 to reach the top five when it reached number three, with only The Chipmunk Song (Christmas Don't Be Late) by David Seville and The Chipmunks having a higher rank (peaking at number one for four weeks in 1958-1959). With global sales of over 16 million copies, the song remains Carey's biggest international success and the 11th best selling single of all time. As of 2017, the song was reported to have earned $60 million in royalties. The Daily Telegraph hailed "All I Want for Christmas Is You" as the most popular and most played Christmas song of the decade in the United Kingdom. Rolling Stone ranked it fourth on its Greatest Rock and Roll Christmas Songs list, calling it a "holiday standard." Due to the song's lasting impact, Carey was dubbed the "Queen of Christmas", a title she is hesitant to accept. "I don't accept that name because I feel like it's [too much]," she said. "I humbly thank them and I do have an extraordinary love for the holiday season, and it is the best time of the year." Carey released a children's book based on "All I Want for Christmas Is You" on November 10, 2015, which went on to sell over 750,000 copies. She later released an animated family film based on the book and song on November 14, 2017. When the song was first released as a single in 1994, no remixes were commissioned. Carey re-released the song commercially in Japan in 2000, with a new remix known as the So So Def remix. The remix contains new vocals and is played over a harder, more urban beat that contains a sample of Afrika Bambaataa & the Soulsonic Force's "Planet Rock;" it features guest vocals by Jermaine Dupri and Bow Wow. The remix appears on Carey's compilation album Greatest Hits (2001) as a bonus track. A video was created for the So So Def remix, but it does not feature Carey or the hip-hop musicians that perform in the song. Instead, the video is animated and based on a scene in the video from Carey's "Heartbreaker" (1999). It features cartoon cameo appearances by Carey, Jermaine Dupri, Bow Wow, Luis Miguel (Carey's boyfriend at the time), Carey's dog Jack, and Santa Claus. In 2009 and 2010, the song was included in a music video accompanying ESPN's (and their sister station, ABC) Christmas Day coverage of the NBA. In 2009, a remix produced by Carey and Low Sunday, called "Mariah's New Dance Mix", was released. The mix laid the original 1994 vocals over new electronic instrumentation. The remix garnered a positive response. MTV's Kyle Anderson wrote that "it's difficult to improve perfection," but that the remix "does dress up the song in a disco thump that should make your office Christmas party 28 percent funkier than it was last year." Idolator's Becky Bain praised the song's catchiness. In 2010, Carey re-recorded the song for her thirteenth studio and second holiday album, Merry Christmas II You. Titled "All I Want for Christmas Is You (Extra Festive)", the new version featured re-recorded vocals, softer bell ringing and stronger drumming, and an orchestral introduction that replaced the slow vocal introduction. Steven J. Horowitz from Rap-Up wrote that the new version "sound[ed] just as enjoyable as it did in 1994." While the song was praised, it drew criticism for being too similar to the original. Thomas Connor from the Chicago Sun-Times wrote that the new version "just seems to add a few brassy backup singers to exactly the same arrangement." Caryn Ganz from Rolling Stone agreed, writing that it was "hard to figure out what's 'extra festive'" about the new version. Dan Hancox, editor of The National, also felt the new version was unnecessary. (2012) "All I Want for Christmas Is You (SuperFestive!)" (2011) "All I Want for Christmas Is You (SuperFestive!)" All I Want for Christmas Is You (SuperFestive!) is a duet between Carey and Justin Bieber. The song was recorded on his holiday album, Under the Mistletoe, and released as a radio airplay only single in Italy on December 9, 2011, as the second single from the album. The music video for the duet featuring Bieber was filmed in Macy's department store in New York City, and features Bieber shopping with his friends whilst Carey is seen singing in the background. Carly Rose Sonenclar - The X Factor season 2 finale. She is the second singer to perform this song on the same song. Alex & Sierra (2013) The winners of The X Factor season 3 finale. They are the winners of this final season. ^ a b Frere-Jones, Sasha (April 3, 2006). "On Top: Mariah Carey's Record-Breaking Career". The New Yorker. Retrieved December 10, 2010. ^ a b Grein, Paul (December 14, 2011). "Week Ending Dec. 11, 2011. Songs: Mariah's Christmas Gift". Yahoo! Music. Retrieved December 15, 2011. ^ a b Wile, Rob (December 25, 2013). "The True Story Behind Mariah Carey's 'All I Want For Christmas'". Seattle Post-Intelligencer. Retrieved December 25, 2013. ^ a b "The music industry should be dreaming of a white Christmas". The Economist. Archived from the original on December 1, 2017. Retrieved December 1, 2017. ^ a b c d e f g Zaleski, Annie (December 7, 2015). "Why Mariah Carey Christmas Hit Will Be Around Forever". The A.V. Club. Retrieved January 5, 2015. ^ Phull, Hardeep (December 13, 2014). "12 Things You Didn't Know About Mariah Carey's Christmas Hit". New York Post. Retrieved January 5, 2015. ^ a b c Wile, Rob (December 7, 2015). "The True Story Behind Mariah Carey's 'All I Want For Christmas'". Business Insider. Retrieved January 5, 2015. ^ a b Strecker, Eric (December 7, 2015). "Mariah Carey's 'Merry Christmas' 20th Anniversary: Find Out What Went Into Making a Modern Christmas Classic". Billboard. Retrieved January 5, 2015. ^ "All I Want for Christmas Is You - Mariah Carey". AllMusic. Retrieved September 16, 2012. ^ a b "Mariah Carey – All I Want for Christmas Is You – Digital Sheet Music". Musicnotes.com. ^ Green, Emma (December 7, 2015). "'All I Want for Christmas Is You': A Historical Dialectic". The Atlantic. Retrieved January 5, 2015. ^ a b c d e Ragusea, Adam (December 7, 2015). "'All I Want for Christmas Is You' Is Diminished Chords". Slate. Retrieved January 5, 2015. ^ a b Parisien, Roch. "Merry Christmas > Overview". AllMusic. Retrieved August 29, 2010. ^ a b Ruiz, Michelle (December 7, 2015). "The Enduring Magic of Mariah Carey's 'All I Want for Christmas Is You'". Vogue. Retrieved January 5, 2015. ^ Morse, Steve (December 4, 1994). "Carey marks the season with music, good works". Boston Globe. Retrieved October 19, 2010. ^ Schwartz, Barry (December 21, 2006). "On Second Thought: Mariah Carey – Merry Christmas". Stylus Magazine. Retrieved August 30, 2010. ^ a b Anderson, Kyle (December 1, 2009). "Mariah Carey's 'All I Want For Christmas Is You' Gets The Remix Treatment". MTV. MTV Networks. Retrieved November 10, 2010. ^ a b Bain, Becky (December 1, 2009). "'All I Want For Christmas' Is Mariah's X-Mas Dance Remix". Idolator. Retrieved November 10, 2010. ^ a b Craven, Shona (December 10, 2010). "In Praise Of ... A Very Mariah Christmas". The Herald. Retrieved December 10, 2010. ^ a b Connor, Thomas (November 9, 2010). "Mariah, Boyle's Christmas CDs a couple lumps of coal". Chicago Sun-Times. Archived from the original on November 10, 2010. Retrieved November 10, 2010. ^ a b Whitburn, Joel (2004). Christmas in the Charts (1920-2004). Wisconsin: Record Research Inc. p. 26. ISBN 0-89820-161-6. ^ a b "All I Want for Christmas Is You - Mariah Carey". Billboard. Archived from the original on November 11, 2010. Retrieved November 10, 2010. ^ Trust, Gary. "Mariah Carey's 'All I Want for Christmas Is You' Hits Hot 100's Top 10 for First Time, 'Perfect' Still No. 1". Billboard. Retrieved December 18, 2017. ^ Trust, Gary (December 31, 2018). "Mariah Carey's 'Christmas' Climbs to No. 3 on Billboard Hot 100, Ariana Grande's 'Next' Leads for Seventh Week". Billboard. Retrieved January 1, 2019. ^ "Hot 100 Chart Moves: Mariah Carey's 'Christmas' Classic Returns". billboard.com. Retrieved December 12, 2017. ^ "Mariah Carey's 'All I Want For Christmas Is You' Is World's First Double Platinum Holiday Ringtone". Legacy Recordings. PR Newswire. Retrieved November 10, 2010. ^ Grein, Paul (September 24, 2010). "Chart Watch Extra: Songs From The Last Century". Yahoo! Music. Archived from the original on October 5, 2010. Retrieved November 10, 2010. ^ a b Grein, Paul (December 19, 2017). "Chart Watch: Mariah Carey's Christmas classic finally cracks the top 10". Yahoo! Music. Retrieved December 19, 2017. ^ "Top 40 Official UK Singles Archive". The Official Charts Company. December 10, 1994. Archived from the original on June 15, 2011. Retrieved November 28, 2010. ^ "Mariah Carey - All I Want For Christmas Is You". UK Singles Chart. Chart Stats. Retrieved December 6, 2010. ^ "All I Want for Christmas Is You". BBC. Retrieved December 27, 2015. ^ "Mariah Carey's All I Want For Christmas Is You Tops 1 million sales". Official Charts Company. Retrieved December 19, 2013. ^ "BPI - Certified Awards". British Phonographic Industry. Archived from the original on January 17, 2010. Retrieved August 13, 2010. ^ a b Williams, Paul (November 29, 2010). "The Fairytale of New Media". Music Week. United Business Media. Archived from the original on January 4, 2011. Retrieved December 1, 2010. ^ "Christmas classics from Ariana Grande, Michael Buble and more reach new all-time highs on the Official Singles Chart". Official Charts Company. Retrieved December 19, 2017. ^ "Ava Max claims her first Number 1 with Sweet But Psycho on the Official Singles Chart". Official Charts Company. Retrieved December 28, 2018. ^ Kent, David (2006). Australian Chart Book 1993-2005. ISBN 0-646-45889-2. ^ Ryan, Gavin (December 30, 2018). "Australian Charts: Mariah Carey Christmas songs takes top spot on singles chart". Noise11. Retrieved December 30, 2018. ^ "Mariah Carey - All I Want For Christmas Is You (song)". Danishcharts.com. Hung Medien. Retrieved November 10, 2010. ^ "Guld og platin 2008" (in Danish). International Federation of the Phonographic Industry – Denmark. Archived from the original on December 25, 2014. Retrieved June 29, 2010. ^ "29-sai no Kurisumasu" (in Japanese). JDorama.com. Retrieved December 6, 2010. ^ Oricon (19 December 1994). "Top Selling Singles" (in Japanese). Retrieved 25 December 2017. ^ Oricon (26 December 1994). "Top Selling Singles" (in Japanese). Retrieved 25 December 2017. ^ a b c The World's Number-Two Music Market Is No Afterthought. Billboard. Prometheus Global Media. August 5, 1995. Retrieved August 15, 2010. ^ "RIAJ - Statistics - Other Data - List of million-certified compact discs by year - 1994" (in Japanese). Recording Industry Association of Japan. riaj.or.jp. Retrieved April 28, 2010. ^ "RIAJ - Statistics - Certification of Music Download - December 2008" (in Japanese). Recording Industry Association of Japan. riaj.or.jp. Retrieved April 28, 2010. ^ "Virtual Tickets". Mariahcarey.com. Archived from the original on March 6, 2010. Retrieved November 10, 2010. ^ "The Stars Are Heading Down Santa Claus Lane". Disney. December 21, 2004. Retrieved November 10, 2010. ^ "Mariah Rings In 2010 at Madison Square Garden, NY". Mariahcarey.com. January 1, 2010. Archived from the original on August 7, 2011. Retrieved December 20, 2010. ^ "Mariah Tapes ABC Christmas Special, Grants A Fan's Wish". Mariahcarey.com. November 9, 2010. Archived from the original on July 21, 2011. Retrieved November 10, 2010. ^ "Mariah Performs at Disney Christmas Day Parade". Mariahcarey.com. December 4, 2010. Archived from the original on December 7, 2010. Retrieved December 6, 2010. ^ "Watch Adele, Chris Martin, Red Hot Chili Peppers, Mariah Carey and more in 'Carpool Karaoke' Christmas special - NME". NME. December 16, 2016. Retrieved December 16, 2016. ^ "Mariah Carey hit is most popular Christmas song". The Daily Telegraph. December 10, 2010. Archived from the original on January 31, 2011. Retrieved January 28, 2011. ^ Greene, Andy. "The Greatest Rock and Roll Christmas Songs". Rolling Stone. Retrieved December 20, 2010. ^ Oswald, Anjelica (November 17, 2017). "Mariah Carey shows a humble side and rejects the title of 'Queen of Christmas'". The Insider. Retrieved November 19, 2017. ^ "Mariah Carey Announces Children's Book Based on All I Want for Christmas Is You: People.com". People. Retrieved December 23, 2015. ^ "Mariah Carey's "All I Want for Christmas Is You" Song Gets Movie Treatment". The Hollywood Reporter. Archived from the original on November 22, 2017. Retrieved November 22, 2017. ^ "All I Want For Christmas Is You Animated Film". Press Release. Archived from the original on November 22, 2017. Retrieved November 22, 2017. ^ "Australian-charts.com – Mariah Carey – All I Want for Christmas Is You". ARIA Top 50 Singles. Retrieved December 29, 2018. ^ "Austriancharts.at – Mariah Carey – All I Want for Christmas Is You" (in German). Ö3 Austria Top 40. Retrieved January 2, 2019. 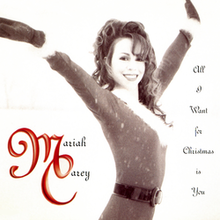 ^ "Ultratop.be – Mariah Carey – All I Want for Christmas Is You" (in Dutch). Ultratop 50. Retrieved May 1, 2015. ^ "Mariah Carey – Chart history" Brasil Hot 100 Airplay for Mariah Carey. Retrieved May 1, 2015. ^ "Mariah Carey Chart History (Canadian Hot 100)". Billboard. Retrieved January 1, 2019. ^ "ČNS IFPI" (in Czech). Hitparáda – Radio Top 100 Oficiální. IFPI Czech Republic. Note: Change the chart to CZ – RADIO – TOP 100 and insert 201651,52 into search. Retrieved January 4, 2019. ^ "ČNS IFPI" (in Czech). Hitparáda – Digital Top 100 Oficiální. IFPI Czech Republic. Note: Change the chart to CZ – SINGLES DIGITAL – TOP 100 and insert 201652 into search. ^ "Track Top-40 Uge 49, 2018". Hitlisten. Retrieved December 12, 2018. ^ "Europe Official Top 100". January 1, 2019. Retrieved January 1, 2019. ^ "Mariah Carey: All I Want for Christmas Is You" (in Finnish). Musiikkituottajat – IFPI Finland. Retrieved December 31, 2018. ^ "Top Singles (téléchargement + streaming)". Syndicat National de l'édition Phonographique. December 28, 2018. Retrieved December 31, 2018. ^ "Offiziellecharts.de – Mariah Carey – All I Want for Christmas Is You". GfK Entertainment Charts. Retrieved December 21, 2018. ^ "Greece Digital Songs". Billboard. Retrieved May 22, 2015. ^ "Archívum – Slágerlisták – MAHASZ" (in Hungarian). Single (track) Top 40 lista. Magyar Hanglemezkiadók Szövetsége. Retrieved May 1, 2015. ^ "Archívum – Slágerlisták – MAHASZ" (in Hungarian). Stream Top 40 slágerlista. Magyar Hanglemezkiadók Szövetsége. Retrieved December 27, 2015. ^ "Íslenski Listinn Topp 40 (22.12.1994 - 27.12.1994)" (PDF). Dagblaðið Vísir - Tónlist. Retrieved 2018-03-14. ^ "The Irish Charts – Search Results – All I Want for Christmas Is You". Irish Singles Chart. Retrieved May 22, 2015. ^ "Top Singoli – Classifica settimanale WK 52" (in Italian). Federazione Industria Musicale Italiana. Retrieved December 29, 2018. ^ マライア・キャリーのアルバム売り上げランキング (in Japanese). Oricon. Archived from the original on December 6, 2013. Retrieved May 22, 2015. ^ "Mariah Carey Awards". AllMusic. Retrieved May 1, 2015. ^ "Billboard Japan Hot Overseas". Billboard Japan (in Japanese). December 26, 2016. Retrieved December 20, 2016. ^ "Top 20 Most Streamed International & Domestic Singles in Malaysia" (PDF). Recording Industry Association of Malaysia. Retrieved January 3, 2019. ^ "Nederlandse Top 40 – week 1, 1995" (in Dutch). Dutch Top 40 Retrieved May 20, 2015. ^ "Dutchcharts.nl – Mariah Carey – All I Want for Christmas Is You" (in Dutch). Single Top 100. Retrieved December 31, 2016. ^ "NZ Top 40 Singles Chart". Recorded Music NZ. December 31, 2018. Retrieved December 28, 2018. ^ "VG-lista – Topp 20 Single uke 50, 2017". VG-lista. Retrieved December 16, 2017. ^ "Listy bestsellerów, wyróżnienia :: Związek Producentów Audio-Video". Polish Airplay Top 100. Retrieved December 28, 2015. ^ "Portuguesecharts.com – Mariah Carey – All I Want for Christmas Is You". AFP Top 100 Singles. Retrieved January 3, 2019. ^ "Portugal Digital Songs". Billboard. Retrieved May 22, 2015. ^ "Official Scottish Singles Sales Chart Top 100". Official Charts Company. Retrieved December 22, 2015. ^ "Singapore Top 30 Digital Streaming Chart – Week 52" (PDF). Recording Industry Association (Singapore). Archived from the original (PDF) on January 3, 2019. ^ "ČNS IFPI" (in Slovak). Hitparáda – Radio Top 100 Oficiálna. IFPI Czech Republic. Note: insert 201851 into search. Retrieved 4 January 2019. ^ "ČNS IFPI" (in Slovak). Hitparáda – Singles Digital Top 100 Oficiálna. IFPI Czech Republic. Note: Select SINGLES DIGITAL - TOP 100 and insert 201850 into search. Retrieved December 18, 2018. ^ "SloTop50 – Slovenian official singles chart". slotop50.si. Retrieved December 18, 2016. ^ "Spanish Digital Songs Charts". spanishcharts.com. Retrieved January 3, 2019. ^ "Sverigetopplistan – Sveriges Officiella Topplista". Sverigetopplistan. Retrieved December 8, 2018. ^ "Mariah Carey: Artist Chart History". Official Charts Company. Retrieved May 22, 2015. ^ "Official R&B Singles Chart Top 40". Official Charts Company. Retrieved December 22, 2015. ^ "Mariah Carey Chart History (Hot 100)". Billboard. Retrieved January 1, 2019. ^ "Mariah Carey Chart History (Adult Contemporary)". Billboard. Retrieved May 22, 2015. ^ "Mariah Carey Chart History (Adult Pop Songs)". Billboard. Retrieved May 22, 2015. ^ "Mariah Carey Chart History (Holiday 100)". Billboard. Retrieved November 20, 2018. ^ "Mariah Carey Chart History (Pop Songs)". Billboard. Retrieved May 22, 2015. ^ "Mariah Carey Chart History (Rhythmic)". Billboard. Retrieved May 22, 2015. ^ "Jaarlijsten 1994" (in Dutch). Stichting Nederlandse Top 40. Retrieved May 25, 2015. ^ "Jaarlijsten 1995" (in Dutch). Stichting Nederlandse Top 40. Retrieved May 25, 2015. ^ "End of Year Singles Chart Top 100 - 2007". Official Charts Company. Retrieved October 11, 2015. ^ "Összesített singles- és válogatáslemez-lista – eladási darabszám alapján - 2016". Mahasz. Retrieved January 14, 2017. ^ "International Digital Chart" (in Korean). Gaon Music Chart. Archived from the original on January 21, 2017. Retrieved January 15, 2016. ^ "Összesített singles- és válogatáslemez-lista – eladási darabszám alapján - 2017". Mahasz. Retrieved February 17, 2018. ^ "ARIA Chart Watch #501". auspOp. December 1, 2018. Retrieved December 1, 2018. ^ "Ultratop − Goud en Platina – singles 2018". Ultratop. Hung Medien. Retrieved January 5, 2018. ^ "Canadian single certifications – Mariah Carey – All I Want For Christmas Is You". Music Canada. Retrieved December 13, 2016. ^ "Certificeringer – Mariah Carey – 'All I Want For Christmas Is You' Track". IFPI Denmark. Retrieved January 9, 2018. ^ "Gold-/Platin-Datenbank (Mariah Carey; 'All I Want For Christmas Is You')" (in German). Bundesverband Musikindustrie. Retrieved November 16, 2018. ^ "Italian single certifications – Mariah Carey – All I Want for Christmas Is You" (in Italian). Federazione Industria Musicale Italiana. Retrieved May 22, 2015. Select "2014" in the "Anno" drop-down menu. Select "All I Want for Christmas Is You" in the "Filtra" field. Select "Singoli online" under "Sezione". ^ a b "RIAJ Million List – マライア・キャリー 恋人たちのクリスマス ソニーレコード 1994.10.29" (in Japanese). Recording Industry Association of Japan. Retrieved December 22, 2015. ^ "New Zealand single certifications – Mariah Carey – All I Want for Christmas Is You". Recorded Music NZ. Retrieved December 11, 2015. ^ "Norwegian single certifications – Mariah Carey – All I Want for Christmas Is You" (in Norwegian). IFPI Norway. Retrieved 9 November 2018. ^ "Spanish single certifications – Mariah Carey – All I Want for Christmas Is You". Productores de Música de España. Retrieved May 22, 2015. ^ Copsey, Rob (November 14, 2018). "Mariah Carey's Top 40 biggest singles on the Official Chart". Official Charts Company. Retrieved November 14, 2018. ^ "British single certifications – Mariah Carey – All I Want for Christmas Is You". British Phonographic Industry. Retrieved November 3, 2017. Select singles in the Format field. Select Platinum in the Certification field. Type All I Want for Christmas Is You in the "Search BPI Awards" field and then press Enter. ^ a b "American single certifications – Mariah Carey – All I Want for Christmas Is You". Recording Industry Association of America. Retrieved December 19, 2017. If necessary, click Advanced, then click Format, then select Single, then click SEARCH. ^ Hoppes, Lynn (December 17, 2009). "Behind the scenes with Mariah Carey". ESPN. Retrieved November 29, 2010. ^ Juzwiak, Rich (November 10, 2010). "On Mariah Carey's Agreeably Bizarre Yuletide Sequel Merry Christmas II You". The Village Voice. Archived from the original on November 12, 2010. Retrieved November 10, 2010. ^ Horowitz, Steven J. "Album Preview: Mariah Carey – 'Merry Christmas II You'". Rap-Up. Archived from the original on October 26, 2010. Retrieved November 10, 2010. ^ Ganz, Caryn (November 2, 2010). "Mariah Carey: Merry Christmas II You". Rolling Stone. Archived from the original on November 15, 2010. Retrieved November 10, 2010. ^ a b Ford, Rebecca (November 30, 2011). "Justin Bieber and Mariah Carey's 'All I Want For Christmas' Video Debuts (Video)". The Hollywood Reporter. Retrieved November 23, 2011. ^ "Justin Bieber duet with Mariah Carey - "All I Want For Christmas Is You" (Radio Date: Friday 9 December)" (in Italian). EarOne. Archived from the original on July 1, 2017. ^ "Ultratop.be – Justin Bieber with Mariah Carey – All I Want for Christmas Is You (SuperFestive!)" (in Dutch). Ultratip. Retrieved May 1, 2015. ^ "Justin Bieber Chart History (Canadian Hot 100)". Billboard. Retrieved May 1, 2015. ^ "Justin Bieber Chart History (Japan Hot 100)". Billboard. Retrieved May 1, 2015. ^ "Norwegiancharts.com – Justin Bieber with Mariah Carey – All I Want for Christmas Is You (SuperFestive!)". VG-lista. Retrieved May 1, 2015. ^ "Spanishcharts.com – Justin Bieber with Mariah Carey – All I Want for Christmas Is You (SuperFestive!)" Canciones Top 50. Retrieved May 1, 2015. ^ Tobias Zywietz. "Chart Log UK 2011". zobbel.de. Retrieved May 1, 2015. ^ "Justin Bieber Chart History (Hot 100)". Billboard. Retrieved May 1, 2015. ^ "Justin Bieber Chart History (Adult Contemporary)". Billboard. Retrieved May 1, 2015. ^ "Justin Bieber Awards". AllMusic. Retrieved May 1, 2015. ^ "Have Yourself a Carey Christmas". St. Paul Pioneer Press. December 18, 2009. Retrieved August 19, 2011. ^ Bierly, Mandi (December 17, 2009). "All 'Love Actually' scene-stealer Olivia Olson wants for graduation is a record deal". Entertainment Weekly's EW.com. Retrieved December 2, 2016. ^ Johnny Loftus. "A Cheetah-licious Christmas". AllMusic. Retrieved December 23, 2015. ^ Färsjö, Therese (November 29, 2007). "Julens hetaste par". Expressen (in Swedish). Retrieved December 2, 2016. ^ Hiffmeyer, Paul (November 20, 2007). "Yuletide Cheer". People. Retrieved October 11, 2001. ^ Levine, Nick (December 13, 2007). "'X Factor' final songlist revealed". Digital Spy. Retrieved November 10, 2010. ^ a b Foster, Patrick (December 15, 2008). "X Factor winner Alexandra Burke odds on for Christmas hit". The Sunday Times. Retrieved November 10, 2010. ^ "Sony Music Online Japan: Suemitsu - The Suemith" (in Japanese). Sony Music Entertainment Japan. Archived from the original on January 29, 2009. Retrieved December 27, 2008. ^ Trust, Gary (December 9, 2010). "Weekly Chart Notes: 'Glee' Cast, Katy Perry, Bruno Mars". Billboard. Retrieved December 2, 2016. ^ Moore, Rick (November 29, 2010). "Gift Guide: The Best New Christmas Albums « American Songwriter". American Songwriter. Retrieved December 2, 2016. ^ Rice, Lynette (November 20, 2010). "'Big Time Rush' First Look: Snoop Dogg brings some holiday cheer to the Nickelodeon show". Entertainment Weekly's EW.com. Retrieved December 2, 2016. ^ Byrd, Stephanie (October 22, 2012). "Lady Antebellum spreads holiday cheer". Daily Trojan. Retrieved December 2, 2016. ^ "Weekly Chart Notes: 'Glee' Cast, Katy Perry, Bruno Mars". Billboard. December 9, 2010. Retrieved May 27, 2018. ^ "All I Want For Christmas - Album - Various Artists". iTunes Store. Archived from the original on December 26, 2010. Retrieved December 24, 2010. ^ "Believin'..." recochoku.jp. Retrieved November 24, 2010. ^ NOTA - All I Want For Christmas Is You. December 12, 2010. Retrieved December 23, 2015 – via YouTube. ^ "Merry Flippin' Christmas, Vol. 1 and 2". itunes.apple.com. Retrieved November 8, 2011. ^ Gallo, Phil (August 1, 2011). "Michael Buble Christmas Special Coming to NBC". Billboard. Retrieved August 25, 2011. ^ "Michael Bublé Chart History (Hot 100)". Billboard. Retrieved May 27, 2018. ^ "Michael Bublé Chart History (Adult Contemporary)". Billboard. Retrieved May 27, 2018. ^ Phares, Heather. "Review - Glee: The Music, The Christmas Album, Vol. 2". allmusic. Rovi Corporation. Retrieved December 13, 2011. ^ "Demi Lovato Covers 'All I Want For Christmas Is You' At 'Christmas In Washington' Concert". Idolator. December 23, 2012. Retrieved December 21, 2015. ^ Ariana Grande - "All I Want For Christmas Is You" [Mariah Carey cover] (Live in L.A. 11-10-12). November 11, 2012. Retrieved December 23, 2015 – via YouTube. ^ Sia, Nicole (November 26, 2012). "Let Cee Lo Green's Muppets Christmas Video Thaw Your Cold, Cold Heart | SPIN". Spin. Retrieved December 2, 2016. ^ "Teodora Sava - All I Want for Christmas Is You (cover) - Next Star Romania". youtube.com. Retrieved February 4, 2019. ^ Atomic Tom - All I Want For Christmas Is You (Mariah Carey Cover). December 18, 2013. Retrieved December 23, 2015 – via YouTube. ^ "Melodia 2 Ayahi Takagaki CD Album". CDJapan. Retrieved March 28, 2017. ^ "Park Bom and Lee Hi Release Pretty But Creepy "All I Want for Christmas Is You" MV". Retrieved November 2, 2017. ^ "Theelectricalfire.bandcamp.com". Archived from the original on December 14, 2013. Retrieved December 9, 2013. ^ BT Fasmer. "New Age Music Guide". New Age Music Guide. Retrieved December 23, 2015. ^ Epic Records (November 11, 2014). "Epic Records Caps Banner Year With The Release Of First Holiday EP... -- NEW YORK, Nov. 11, 2014 /PRNewswire/ --". Retrieved December 23, 2015. ^ Cowling, Lauren. "Kelly Clarkson Singing "All I Want For Christmas Is You" is All We Have Ever Wanted for Christmas". One Country. Retrieved December 20, 2018. ^ "The MccLymonts Forever Begins Tonight tour". Archived from the original on January 11, 2016. Retrieved December 23, 2015. ^ Feeney, Nolan (October 14, 2014). "Idina Menzel: It's Too Early for Christmas Music". TIME.com. Retrieved December 2, 2016. ^ Leight, Elias (December 2, 2014). "Exclusive: Hear Mariah Carey's 'All I Want for Christmas Is You' in 20 Different Styles". Billboard. Billboard Music. Retrieved September 15, 2017. ^ Harris, Aisha (December 3, 2014). "Hear "All I Want For Christmas Is You" in Almost Every Style You Can Imagine". Slate. Slate Holdings Group, LLC. Retrieved September 15, 2017. ^ Paula arenas - all i want fior christmas is you. December 15, 2016. ^ "All I Want For Christmas Is You" MUSIC VIDEO - Steve Grand. December 21, 2015. Retrieved December 23, 2015 – via YouTube. ^ "Mumford And Sons Join Kylie Minogue For A Mariah Carey Christmas Cover". baeblemusic.com. December 9, 2015. Retrieved January 3, 2016. ^ "All I Want for Christmas Is You". Billboard.com. Retrieved December 23, 2017. ^ X Factor semi final: Is Saara Aalto's All I Want For Christmas is You song of the night?. November 11, 2012. Archived from the original on December 20, 2016. Retrieved December 3, 2016 – via UnrealityTV. ^ [내 손안에 쥬크박스 쥬스TV] 우주소녀 - all i want for christmas is you #55. December 21, 2015. ^ Friend, David (October 22, 2012). "Indie rockers the Darcys change face, record Mariah Carey Christmas cover". CTV News. Retrieved December 5, 2016. ^ "All I Want for Christmas Is You". Bandcamp.com. Retrieved December 9, 2016. ^ "Ingrid Michaelson on Her New Holiday Single and When It's OK to Play Christmas Music: 'I Have Pretty Strict Rules'". Billboard. Retrieved November 30, 2018.